Jenny Holzer (United States, born 1950), Left Hand, 2007, oil on linen. Private collection. The Portland Museum of Art has recently installed three major works of contemporary art by leading figures in today's art world: Jenny Holzer, Richard Serra, and Ellsworth Kelly. This is the first time that these pieces have been exhibited in Maine. This new installation of work in the Museum's contemporary galleries was lent to the Museum by an anonymous private collector. The three works are all black and white and large in scale, but each exhibits a distinctive surface that engages the visitor in different waysÂ—politically, thematically, and aesthetically. Entitled Surfaces, the installation will be on view until the summer of 2010 at the Portland Museum of Art. The Jenny Holzer painting Left Hand features an enormous handprint along side an enigmatic hand-written inscription that gives the name of an Iraqi detainee who died in Abu Ghraib prison. Like other works in her Protect Protect series, Left Hand is taken from documents recently made public by the United States Government. Holzer exhibited works from this series at the 2007 Biennale in Venice, she observed that, "People find them sad. The prints from the detainees are post-mortem, and it is ghastly to take a dead man's hands and yank them down to make prints. 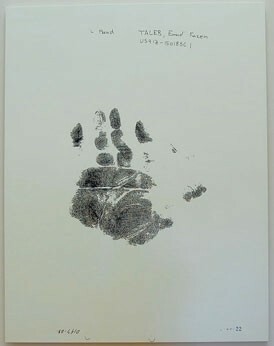 That's why those handprints are distorted." Holzer's identity as an artist has been closely linked to her use of language, specifically aphorisms, that she carves in granite benches or displays as large LED signs, as they might appear in New York's Times Square. The Portland Museum of Art owns a small set of Holzer sayings printed on wooden postcards, one of which reads: "Protect me from what I want." While the powerful Holzer handprint can be read as a solemn, memorial portrait, Ellsworth Kelly's enormous abstract print River II can be seen as a landscape. By combining large sheets of paper to form one continuous black-and-white image, Kelly depicts the surface patterns of water that flows through a river at various stages along its course. The multiple images also suggest scientific x-rays, lined up on a light box to chart the aortic flow of blood, the river of life. More black than white, more activated surface than blank paper, the monumental "drawing" by Richard Serra comes to life at its edges. It is there that the visitor can see how densely the artist has applied paintstick over a base of silkscreen with obsessively overlaid, repetitive gestures. Portland Museum of Art Curator Susan Danly notes, "While Serra's work has grown out of a minimalist aesthetic, the scale, visceral texture, and big, black void of this work overwhelm the viewer. The Museum is fortunate to have the support of collectors and artists whose sensibilities work so well with the grand proportions of our contemporary galleries." Image credit: Jenny Holzer (United States, born 1950), Left Hand, 2007, oil on linen. Private collection.